HOUSTON, Jan. 11, 2018 /PRNewswire/ -- LyondellBasell (NYSE: LYB), one of world's the largest plastics, chemicals and refining companies, has teamed up with the American Institute of Chemical Engineers (AIChE) to teach college professors from around the world about process safety so they can in turn better prepare their students for entering the chemical industry. Last year, LyondellBasell donated $750,000 to the AIChE Foundation to support the organization's Undergraduate Process Safety Learning Initiative, a multi-pronged initiative that will define how the next generation of chemical engineers are prepared to enter the workforce. The initiative is a global effort and core priority of the AIChE Foundation's Doing a World of Good campaign, which focuses on bringing chemical engineering expertise to bear for the good of society. LyondellBasell is part of the campaign's Founders' Circle and has made a major commitment to the process safety learning initiative. 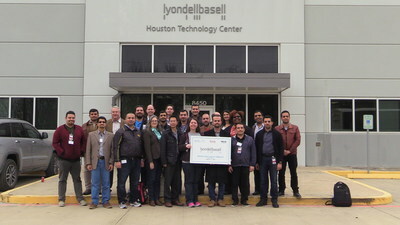 As part of its sponsorship LyondellBasell hosted an industry-led faculty workshop at its Houston Engineering Center from January 9 to 11, to provide chemical engineering professors the tools and information they need to incorporate safety training into their curriculum to ensure their students graduate with a working knowledge of chemical process safety. Dan Coombs, LyondellBasell's executive vice president of Global Manufacturing, Projects, Refining and Technology and member of the AIChE Foundation Board of Trustees Corporate Council, reflected on the benefits of the initiative stating, "At LyondellBasell, we work every day to be the best operated company in the industry and that requires an unwavering commitment to safety. The AIChE Foundation's Undergraduate Process Safety Learning Initiative provides the opportunity for our safety experts to actively engage in better preparing faculty members and developing curriculum that will give the next generation of chemical engineers a foundation of excellence in process safety." More than 30 engineering professors from 16 colleges and universities, including seven Middle Eastern universities, attended the workshop to learn how process safety is put into industrial practice and the importance of process safety to the design and operation of chemical and refining plants. LyondellBasell safety experts led the workshop and reviewed safety best practices and industry case studies with the faculty members. Additionally, visiting professors toured LyondellBasell manufacturing sites to see how process safety solutions are implemented in real life so that these practices can be shared in the classroom. On behalf of AIChE, Executive Director June Wispelwey expressed her appreciation to LyondellBasell for its generosity and commitment to promoting process safety within the chemical engineering industry. "AIChE and our Center for Chemical Process Safety are grateful for LyondellBasell's demonstration of commitment and stewardship, as we work together to promote the safety of the chemical enterprise and expand the knowledge base of practitioners around the world." Some of the topics covered in the workshop included loss prevention strategy, hazard identification methods and risk assessment, dispersion and consequence modeling, inherently safe design, and evaluating the availability of safeguards. AIChE is a professional society of more than 53,000 chemical engineers in 110 countries. Its members work in corporations, universities and government using their knowledge of chemical processes to develop safe and useful products for the benefit of society. Through its varied programs, AIChE continues to be a focal point for information exchange on the frontier of chemical engineering research in such areas as nanotechnology, sustainability, hydrogen fuels, biological and environmental engineering, and chemical plant safety and security. More information about AIChE is available at www.aiche.org.